A ceremonial groundbreaking took place. Taking part (L-R) are Jim Burnsed, former Bryan County chairman; Chris Corr, senior vice president for Rayonier; Russ Carpenter, mayor of Richmond Hill; Carter Infinger, Bryan County Commission chairman; Ann R. Purcell, State Transportation Board chairman; Sen. Ben Watson, District 1; Rep. Ron Stephens, House District 164; Howard Fowler; Carlton Gill, former Bryan County Commission chairman; and Brad Saxon, GDOT district engineer, District 5. The Georgia Department of Transportation (Georgia DOT) held a ceremonial groundbreaking for a new interchange project on Interstate 95 at Belfast Keller Road in the City of Richmond Hill on Oct. 24. The project is being sponsored by Bryan County and is needed to accommodate the expected growth in southern Bryan County. "It's a proud day for the Georgia Department of Transportation along with our partners Bryan County, the City of Richmond Hill and Rayonier. 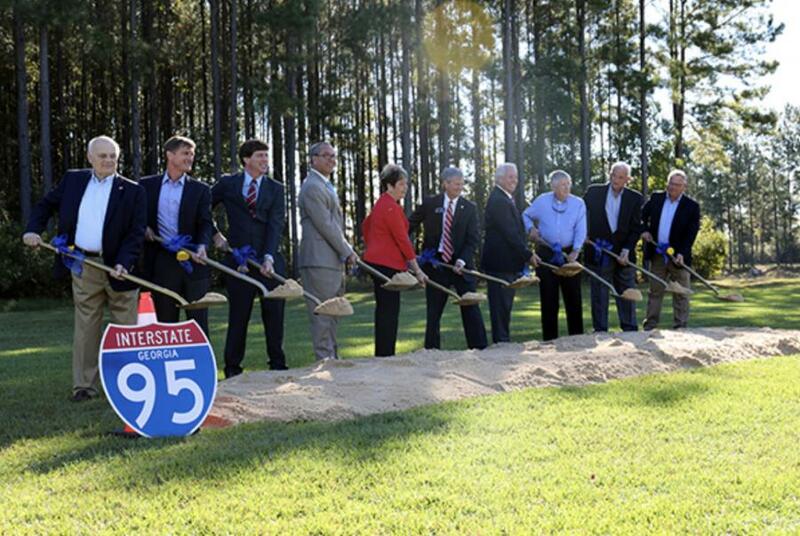 The new I-95 interchange at Belfast Keller Road will serve all the citizens of southern Bryan County with improved connectivity to I-95," said Ann R. Purcell, State Transportation Board chairwoman. "This is a true example of public-private partnership to benefit the entire community through economic development and enhanced safety during natural disasters." Purcell welcomed and recognized state legislators, local dignitaries from Bryan County and the City of Richmond Hill, business partners and Georgia DOT staff. State Sen. Ben Watson, and State Reps. Ron Stephens and Jesse Petrea, all of whom represent Savannah, were in attendance. Those speaking from Bryan County included former County Commission Chairmen Carlton Gill and Jimmy Burnsed, as well as current County Commission Chairman Carter Infinger. Russ Carpenter, mayor of Richmond Hill and Chris Corr, senior vice president, real estate and public affairs for Rayonier also provided remarks. "This interchange improves traffic congestion and vehicle circulation issues to essential services like schools, grocery stores and parks. It improves safety for pedestrians and travelers, and it will increase our sales tax base," Russ Carpenter, Mayor of Richmond Hill said. "Our goal at the City of Richmond Hill is to establish a live, work and play community — and this is an integral step towards making that a reality for our residents." Belfast Keller Road currently crosses I-95 via a two lane overpass bridge, but provides no access to the interstate.The I-95/Belfast Keller Road Interchange Project will construct a new overpass bridge over I-95 on Belfast Keller Road and roundabouts will be installed at the ramp intersections. The only work occurring along I-95 will be the construction of the bridge and the tie-ins of the new ramps for the interchange. The project is anticipated to improve access to I-95 during hurricane evacuations, emergency services and to support existing and future economic growth and development in the region. "The Exit 82 interchange is the result of the great collaboration between Richmond Hill, Bryan County, GDOT and Rayonier over the last decade," said Corr. "We look forward to the future here with great anticipation." The project is estimated to cost $18.8 million and the approximate length of the project is 0.5 mile along I-95 and 0.5 mile along Belfast Keller Road. Construction of the I-95/Belfast Keller Road interchange is anticipated to be complete in 2020.